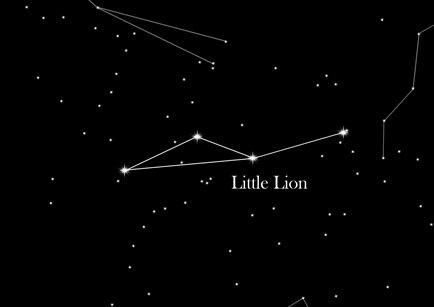 The constellation "Smaller Lion" is not one of the classic, ancient constellations. Therefore, there is no mythological background to this constellation. Naming the constellation happened in 1930 and was a memorable error, which has been preserved until today. When assigning Greek letters to the stars, the astronomer Francis Baily failed to notice that no alpha letter was assigned to "Leo Minor". He provided one of the brighter stars accidentally with the letter beta, which to this day remained the case. The constellation "Smaller Lion" lies between the constellations "Lion" and "Big Bear" in the northern sky. The constellation "Smaller Lion" have many double stars, such as the 40 Leo Minoris and 11 Leo Minoris. Worth noticing is also "R Leo Minoris" - its brightness varies during the period of 372 days between 6.3 m and 13 m.
Since the "Smaller Lion" was not introduced until 1687 by Johannes Hevelius, this constellation is not of Greek mythology. Hevelius added the constellation "Smaller Lion" to his Sky Atlas in 1690 merely as a small filling pattern. The Gdańsk astronomer named the stars even after Greek letters, and in 1930 it became one of the brightest stars with the Greek letter beta linked to it.